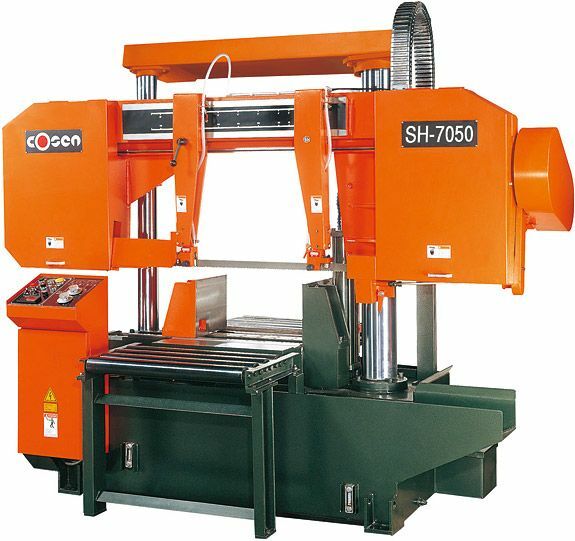 NEW Cosen SH-7050 Semi-Automatic Heavy Duty Bandsaw. 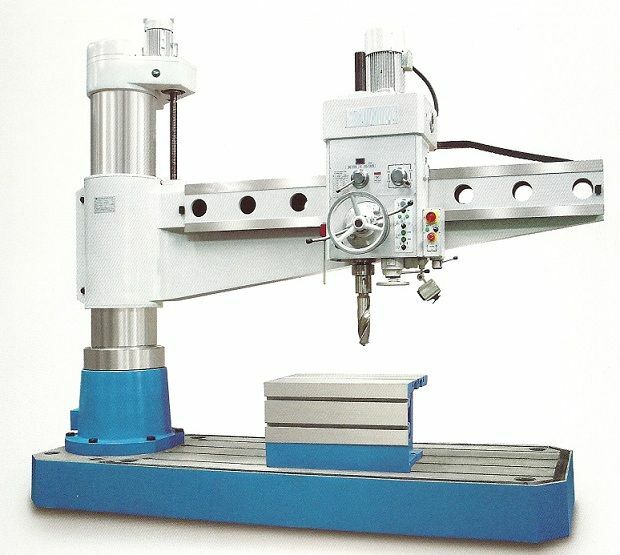 - Precision ground, chrome-plated Dual Columns support and guide the rugged saw head through the entire cutting cycle. 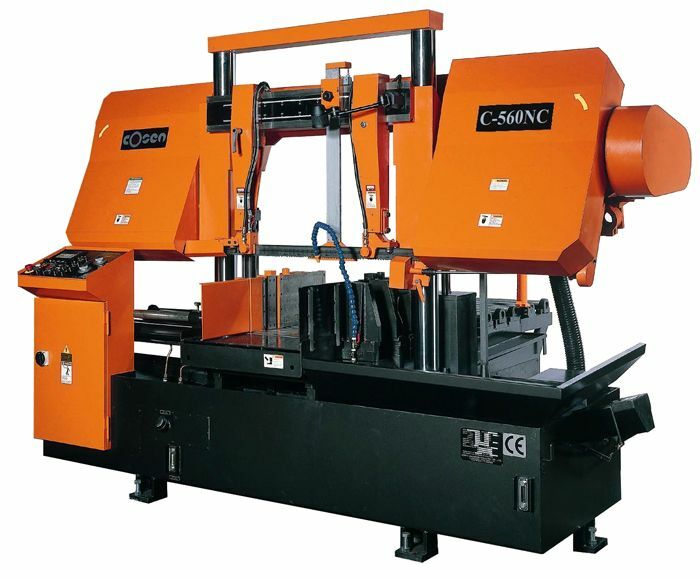 The saw head adopts a back tilt design which allows the blade to twist less than traditional bandsaws between the wheel and blade guide; thereby putting less stress on the blade, insuring longer life. - Cross Link is located on the top of the columns, connecting the two columns to form an archway design that gives it sound structural strength. 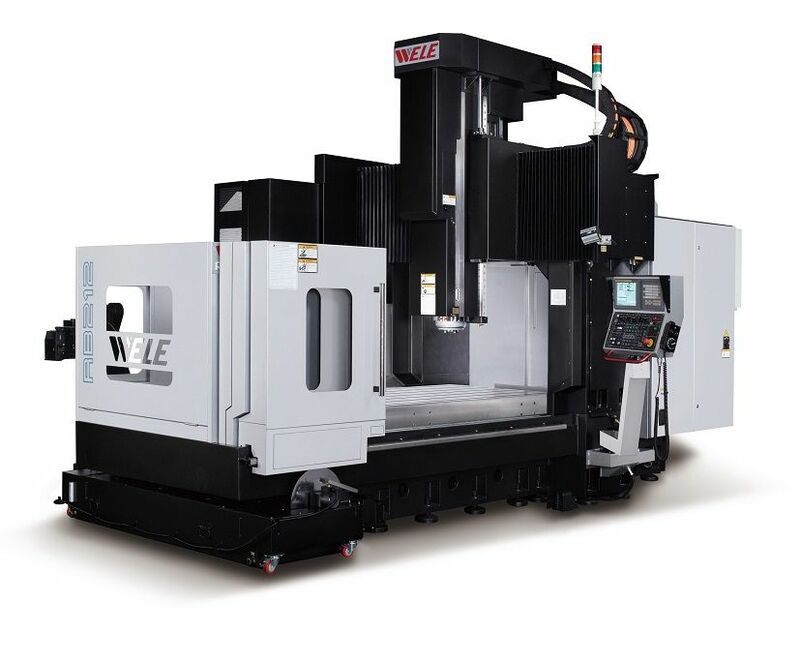 - The oversized round columns provide hundreds of square inches of continuous surface contact with the sawhead throughout the entire cutting process. - The two wheels adopt high-level cast iron and been heat treatment to ensure endurable and long-life. - The gearbox is specially designed to accept high lateral pressure. 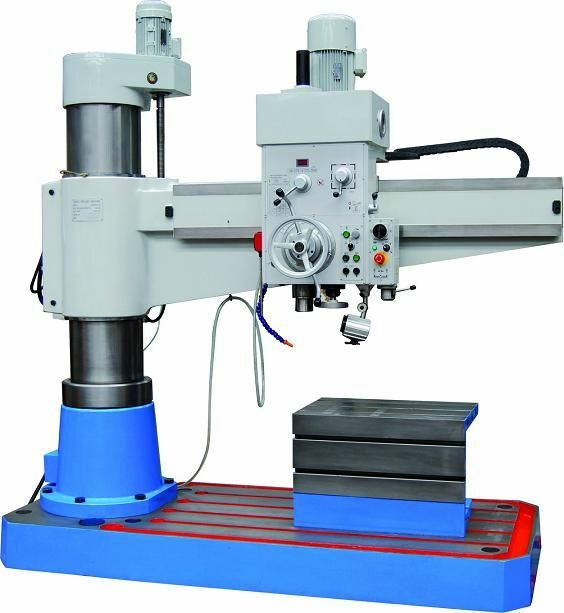 Unlike conventional gearboxes, the Cosen design accepts more pressure during operation and will not create thermal distortion, providing long gearbox life under production conditions. - Carbide guides securely guide the blade during cutting. The carbide guides are relieved to allow coolant flow to lubricate and cool the blade, blade guides, as well as work piece. - The bearing guides eliminate blade stress by pre-aligning the blade before it enters the carbide guides. Two additional guides located on a central axis support the blade from the top, giving it extra penetrating force for faster cuts. - Integral coolant system. Coolant is supplied at three critical points: exit & entry of blade through blade guides, and middle of cut via adjustable flex hose. - Synchronized power driven blade brush effectively cleans chips from blade to extend blade life. 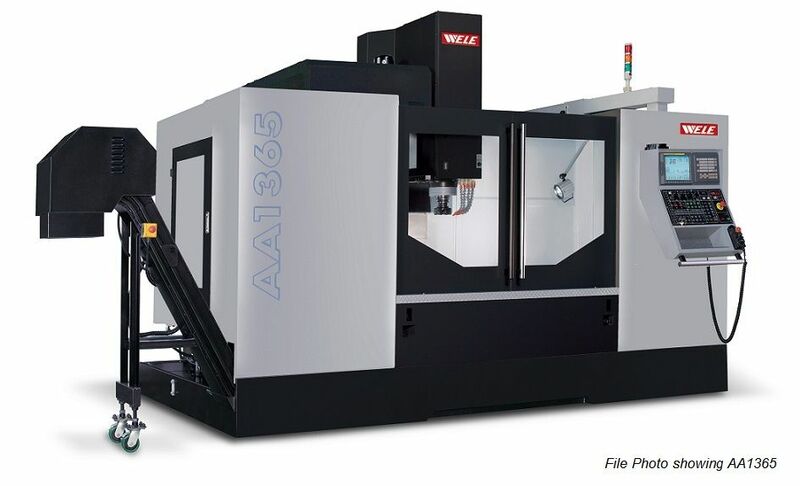 - Precision feed pressure & feed rate dual valve system for optimal cutting performance in any material. 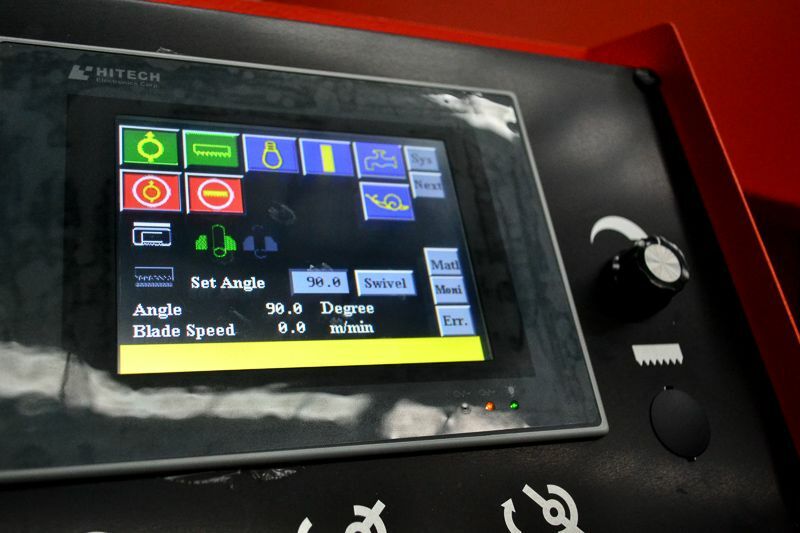 - "Last Cut" or "Keep On" selector switch enables you to choose either to turn the machine off or return the saw head to the pre-selected cut height ready for the next cut. 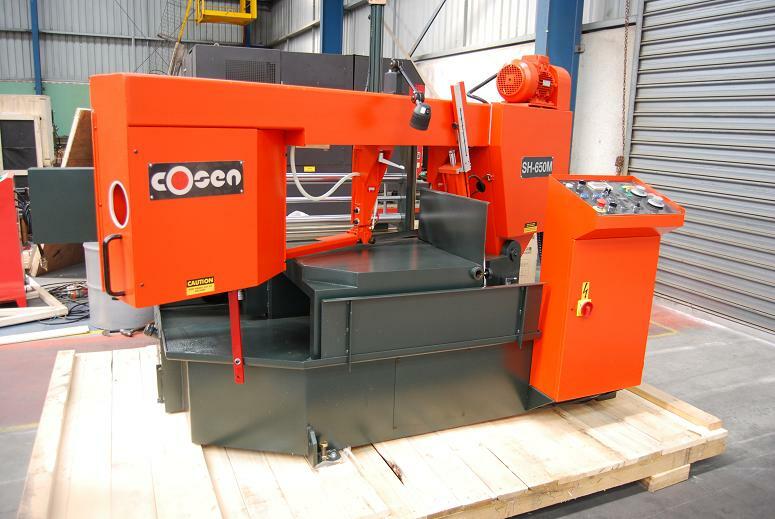 - Work height selector works with “Keep On” selector to position the saw frame to a safe clearance above the work piece preset by the operator, so that the next work piece can be readily positioned without damaging the blade. - Hydraulically powered material lift roller in the saw bed with manually operated take-in enables easy & precise material positioning. 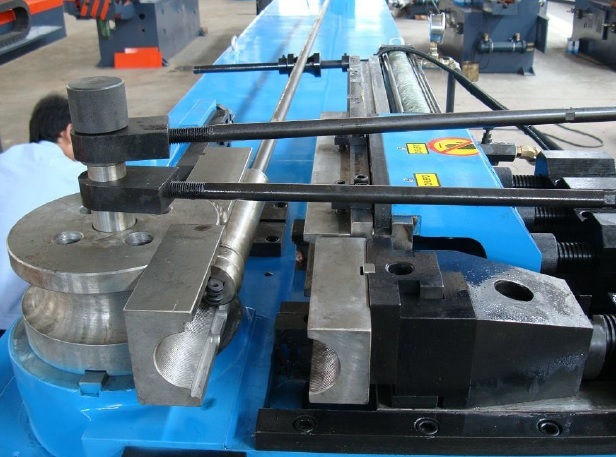 - Heavy-duty 460 mm infeed and 460 mm discharge roller table feature nine 73 mm dia. rollers. 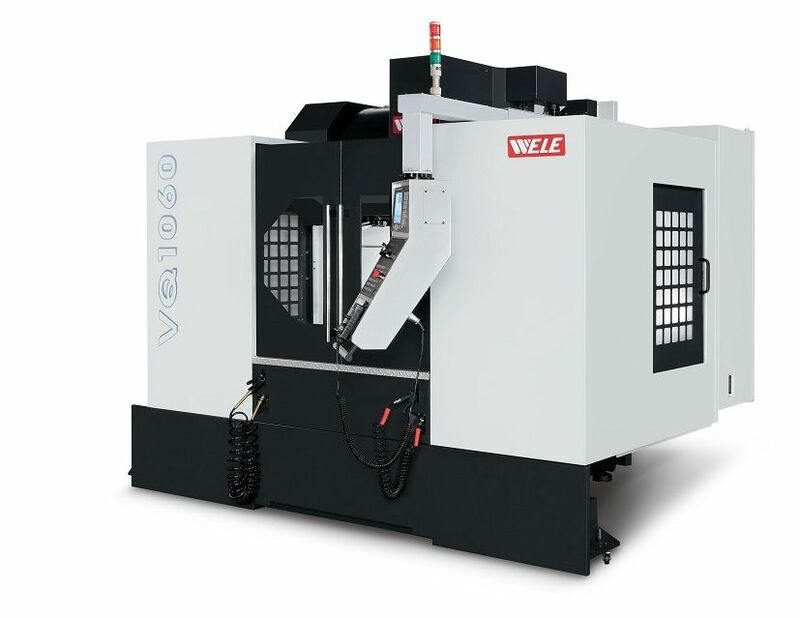 - Large vise-jaw operates hydraulically ensuring secure clamping. The vise rides on ground and hardened replaceable bed plates for long useful life. - Proximity switches sense both blade slippage and blade breakage and will automatically shut off the machine if either of these conditions should occur. 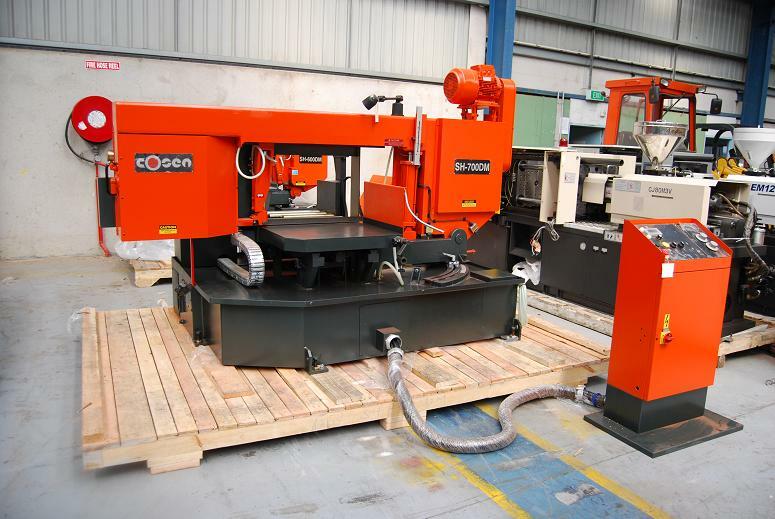 - All blade covers, and guarding on the saw are painted Alert Orange to increase safety alertness. - All exposed electric wiring and hydraulic circuit are protected by conduits. 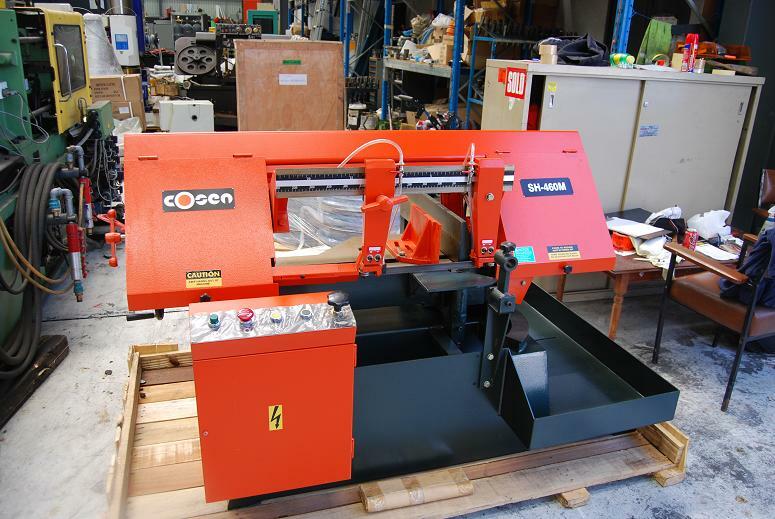 - Electrical and hydraulic safety interlock prevents saw blade to start without vises securely clamped. - Blade “clip” device eases blade changing when necessary by holding the blade on the band wheel during installation, making it very easy for one person to change the blade.